Grain Free Alternatives for Pasta and Pizza, Noodle and Curry Dishes : Courgette Pasta, Cucumber & Carrot Noodles, Broccoli Rice and Cauliflower Cous Cous & Pizza Base. I eat a ‘Paleo’ diet which is 100% grain free. The foundation of this type of nutritional lifestyle advocates a diet high in healthy FAT and protein (and LOADS of veggies of course!) and as low as possible in SUGAR. Were you aware that all grains (from pasta, noodles and rice to breads and even supposedly ‘healthy’ grains like quinoa and buckwheat) are broken down by the body as SUGAR, much in the same way as the deadly white stuff is? Did you know that a bowl of white rice has 97% of the sugar content of granulated sugar once metabolised in the body? No, neither did I! Complete shocker isn’t it?! I almost choked on my ricecake when I heard this… Needless to say I haven’t eaten a ricecake since, these days it’s avocadoes all the way. You can read all about the hidden sugars in grains and fruit here in my article ‘Can a Steak Really be Healthier for you than a Carrot? The Fat vs. Sugar Debate‘ where I explore the topic in great detail. But then, I hear you ask- what on earth will I eat with my curries? and how am I supposed to eat Asian inspired dishes? and how on earth can you eat Italian without pasta or pizza?! Well, I’m going to tell you. It was a revelation for me and my culinary inventiveness has since mushroomed. Spices: (1/4 tsp mustard seeds, 1/4 tsp fenugreek seeds, 1/4 tsp cumin seeds, 1/2 tsp turmeric, 1 bay leaf, 1 tsp curry powder, wee pinch paprika, wee pinch cinnamon). Tin of coconut milk or bar of creamed coconut. To make the Cauliflower Rice, chop the cauliflower into florets and put them through the food processor on the ‘grater’ setting- so you will need to feed them through from the top. (If you don’t have a food processor, hand grate it). Heat the coconut oil in a biggish heavy based pan- better than a wok for this. Once hot, chuck in a couple of mustard seeds (if it’s hot enough they should ‘pop’) when it is hot enough add the remaining mustard seeds, the fenugreek seeds and the cumin seeds. Add the onions and sweat for a couple of minutes followed by the garlic and ginger and sweat for another minute or so. Then add a touch of water to create a smooth, slightly liquidy texture and add in the other spices- the curry powder, paprika, coriander, cinnamon, the bay leaf. Rinse your lentils and then stir them in, and pour in two cups of water. Season generously with salt and pepper. Keep on a medium heat to cook the lentils, stir frequently, keep an eye on it and add more water whenever necessary (lentils really absorb water and have a tendency to stick to the bottom of the pan if left unattended). Once the lentils are cooking well you can turn it down to a low simmer. It’s really quick, should be done in 15 minutes or so, 20 max. Lastly, grate a generous chunk of your creamed coconut bar and stir in. 1/4 of a bar perhaps? Maybe more, it depends how creamy you want it. Or add your tin of coconut milk. Stir in half the can and taste and decide if you want it to be more creamy, and if so, add the rest. Fat is GOOD remember! To heat the cauliflower rice to serve: heat a tsp of coconut oil in a pan, add the cauliflower, stir, pop a tiny bit of boiling water in there and stick a lid on to steam for literally a minute. Add salt and pepper, and that’s it done. Serve your Cauliflower Rice and Dhal with a squeeze of lemon juice on top, or lemon wedge on the side, and fresh coriander sprinkled over the top. To Serve: Toasted sesame oil and you could add some sesame seeds (normal or black), fresh coriander, fresh lime or lemon juice, soya sauce (if you tolerate soya well) Tamari if gluten free. Or if you are soya intolerant you could get your hands on a bottle of ‘coconut aminos’ if you wanted to. To make the meatballs, finely chop the spring onions and garlic and empty the pork mince into a big bowl. Mix altogether (use your hands) and add the egg (beaten) and the ground ginger/chilli and season generously with salt and pepper. Shape into meatballs, each about the size of a ping pong ball. You will probably want to use a little bit of flour on your hands to help form these (use whatever you can tolerate but as a grain free advocate I would plump for using a small amount of coconut flour or gram (chickpea) flour over buckwheat, rice or wheat flours, but you can use anything). Bake on a tray in the oven for 25 to 30 mins. They’ll be ready when they are going slightly golden. Some of the egg might seep out, doesn’t look that pretty but they won’t taste any less delicious. While your meatballs are baking prepare your noodles: SPIRALIZE the carrots and courgettes if you have your trusty gadget to hand. Peel the carrots first. If not, use your wide-blade peeler and peel along the lengths of the carrots and courgette to create thick noodles. If these are going to be sitting around for a while whilst I am cooking I might put them in a bowl of cold water to keep them fresh. Once your meatballs have been in for 15 mins or so get your wok ready. Heat 1 tbsp coconut oil and add roughly bashed and 3 chopped spring onions, 1 chopped red chilli, 2 cloves of chopped garlic and a thumb of ginger and sautee. You can then add your noodles IF you are not going for the ‘extra veg’ option. If you ARE going ‘extra veg’ leave your noodles for now and add in your chosen veg- a few broccoli stems, a handful of sugar snap peas and sliced baby corn, pak choi… whatever your heart desires. Stir fry for a few mins on a high heat. I like to put in a small amount of boiling water and stick a lid on (or a chopping board over the top) and allow the veg to steam slightly. The less time spent cooking these the better, to keep the bright colour, and all the nutrients in. Then add in your carrot/courgette noodles, heat them through, they need under a minute. 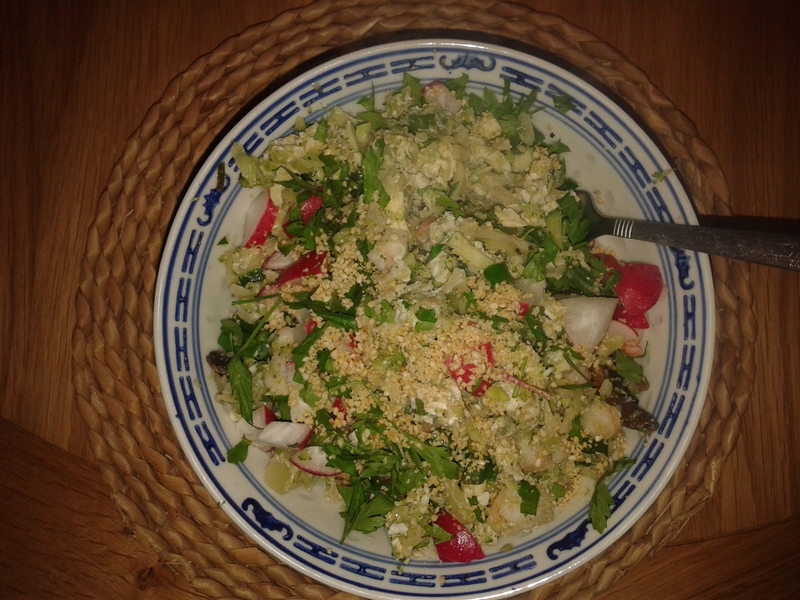 Coat with toasted sesame oil, a generous squeeze of lime juice and soya/tamari/coconut aminos (all optional). Serve the noodles with the meatballs on top and garnish with sesame seeds, and fresh corainder if you wish. Really simple. Spiralize your cucumber noodles and put in serving bowls (or finely chop into thin strips/julienne/peel). Fry your tuna steaks in coconut oil (3 mins on each side), fry your eggs (keep the yolk runny), assemble on top of the noodles, season with salt and pepper, scatter the chopped spring onions on top, drizzle with sesame oil and squeeze lime juice on top and sprinkle with sesame seeds. Yum. So quick, so tasty, so simple- and use whatever veg you happen to have lying around! And then whatever you want to mix in; maybe some veg like mangetout/sugar snap peas/peas/green beans/peppers/mushrooms, whatever! Maybe some prawns, some chicken, some tofu. Whatever floats your culinary boat. Garnishes: Toasted sesame oil and soya sauce (or alternatives like Tamari/Coconut Aminos) if you wish, Lemon or lime juice, fresh coriander. To make the Broccoli Rice chop your broccoli florets and put through the food processor on the grater setting. Either that or hand grate. In a wok heat the coconut oil and chuck in your base of chilli, garlic, ginger and spring onions. Add your meat, fish, tofu (whatever you’ve chosen), add your veg, stir fry for the least amount of time possible to keep all the veg fresh. Once there, add the broccoli rice. put in a tiny amount of boiling water and put on a lid (or sit a wooden chopping board on top) to steam for a minute or two. Take the lid off, create a small ‘well’ in the mixture and crack your eggs into the pan. Scramble and then mix through the whole mixture until there is a scrambled egg texture throughout it. Drizzle with a generous glug of sesame oil and squeeze of lemon and lime. Serve in bowls and garnish with whatever your fancy- soya sauce or alternatives, sesame seeds, coriander, maybe some chopped radishes, cashew nuts/peanuts…. be creative! You CAN do Italian without pizza and pasta, here’s how. 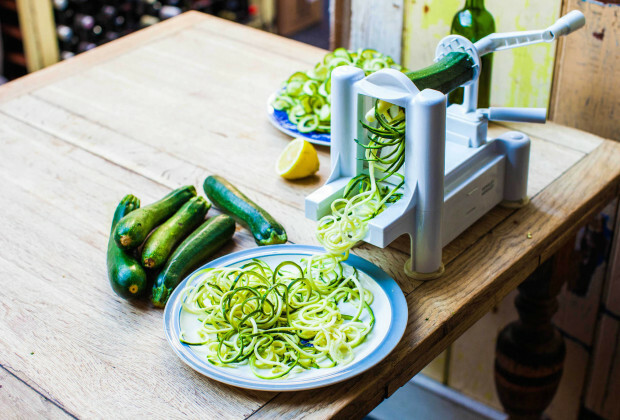 Spiralize your courgette. You can keep it as a raw element and top with the hot ragu sauce, or you can put a little oil in a pan and lightly fry the courgette for a quick minute to warm it through before serving (the spirals will loose their shape though- I prefer raw). Yum! Grate some parmesan on top if you wish. 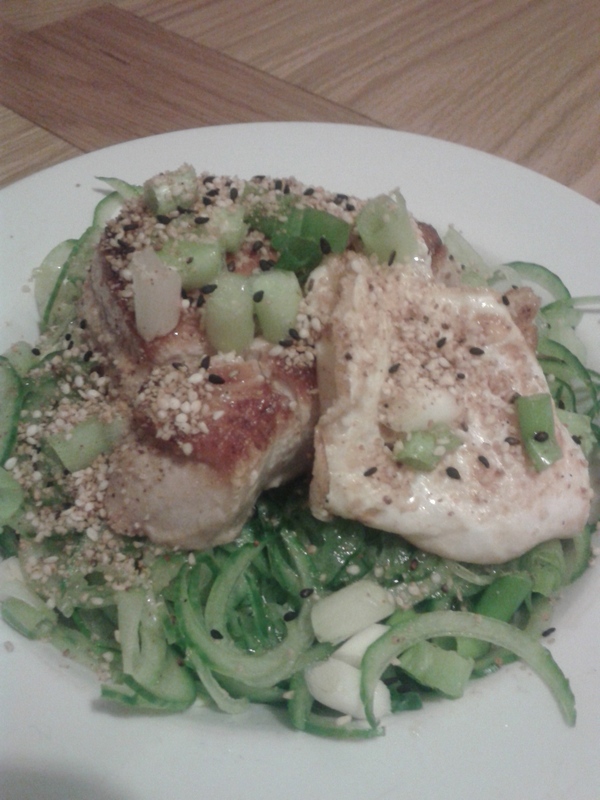 Why not have the same but with spiralized Butternut Squash instead of courgette? (I think this would be particularly amazing with Wild Boar mince…) Or celeriac? Or go vegan and have the courgette pasta with pesto made from whizzing together a big bunch of parsley, toasted sunflower seeds, garlic, lemon juice, olive oil and a dash of water in a blender), maybe add in some cooked green lentils, some olives… go carnivore and incorporate some cooked chicken. Experiment! Who says you can’t be grain free and eat pizza? Crazy people. If you have a food processor: Chop and weigh your cauliflower and put through the food processor on the grater setting. Change the blade to the mixer setting and blend together ALL the ingredients. Grease a baking tray with coconut oil and spread the mixture onto it in as ‘pizza-y’ a way as you can. I usually go for a wonky rectangle. If you manage to make something circular, wow, precision, kudos to you! Top with whatever you want: a tomato sauce (made out of the ingredients from the recipe above Ragu but without the mince) and cheese (Mozzarella or Feta or Goat’s Cheese). Vegetables like peppers, mushrooms, artichokes, olives, red onion, or why not parma ham, figs, rocket (the rocket and figs post cooking, obvs)…. Again experiment! Bake for 20 mins. N.B. Flip it after 15 mins using a fish slice so it gets browned on both sides. Make the Cauliflower pizza base (above) without putting anything on it. Just cook it by itself, and while it is cooking we will prepare the topping separately. Fry a pack of lamb mince fried in onions and garlic. Add in a 1/2 tsp of harissa paste, 1/4 tsp cumin, 1/2 tsp cinnamon, 1/2 tsp dried mint, salt and pepper, and mix in a handful of frozen peas. Once cooked dish out on top of the pizza base just after it comes out the oven, and add some cucumber slices on top, some fresh mint, some finely sliced red onion and a drizzle of tahini. 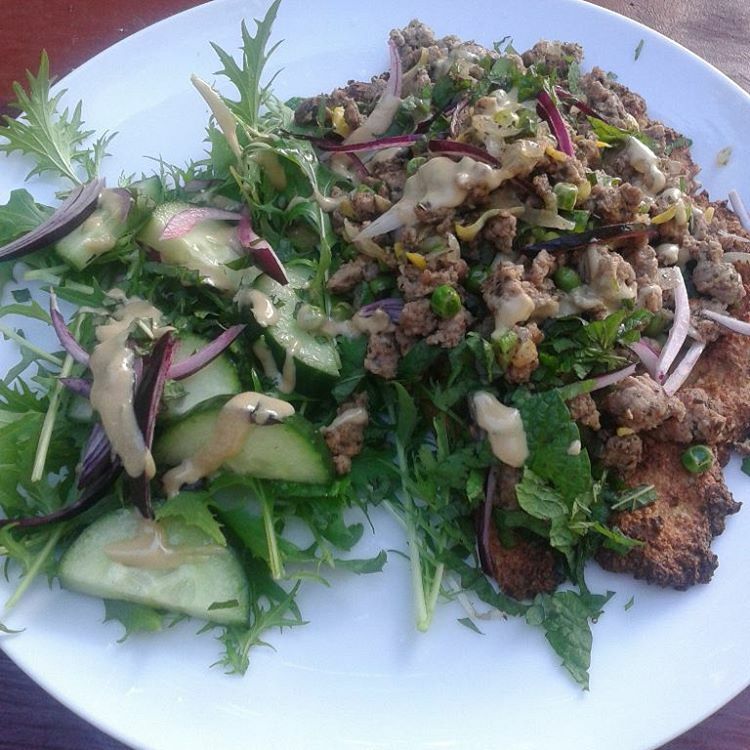 Serve with a rocket salad. This is AMAZINGLY tasty. Another great way to use these flavours is to make cauliflower rice and use the same ingredients (minus the peas) and make the lamb mince into meatballs. Cook the peas separately and serve the cauliflower rice in the bottom of the bowl, sprinkle with the peas, put the lamb meatballs on top, followed by the cucumber, fresh mint, fresh parsley too is good, finely sliced red onion and tahini. Maybe you want to skip the peas and chuck a handful of pomegranate seeds over the top instead? SO many possibilities! Who needs pasta, rice or noodles? Ditch them and cooking just got much more exciting. Not to mention your future health thanks you in advance!